On the way back down the river, it's a rather long distance so you might consider stopping for a pampered evening at Old Saybrook. We say pampered, because here is the home of Saybrook Point Inn - Marina , Spa, and Conference Center . 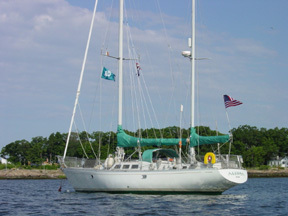 It's the only marina in Connecticut to be awarded the coveted 5 Bells by the Atlantic Cruising Club. With spectacular views of Long Island Sound and the Connecticut River , the gourmet restaurant Terra Mar Grille maintains a 4 diamond AAA rating. The hotel and spa has been rated one of the best in the country by Zagat's; a session at the spa qualifies you for use of the full service health club. So if you'd care to pamper yourself in style, make reservation well in advance to ensure availability of your favorite service. If you can tear yourself away, you can visit the charming village of Old Saybrook , about a mile and a half away from the Saybrook Point Marinas. The local Chamber of Commerce has developed a walking tour of the historic gaslight district available online at http://oldsaybrook.com/. The town boasts more historic buildings (18th century colonial saltbox and Georgian) and 19th century Federal than most other New England towns. Don't miss the historic c1790 James Gallery and Soda Fountain, which has served as a general store, pharmacy, soda fountain, and marine art gallery over time, and serves as a B&B today. 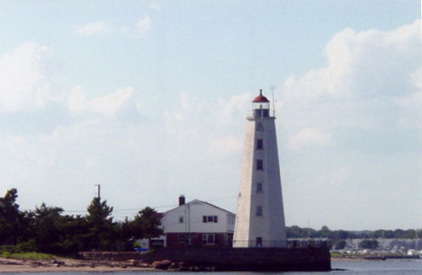 Lynde Point Lighthouse marks the approach to Saybrook Point. If you are visiting in the summer, take the trolley tour. The full loop takes about and hour and the driver usually does an annotated commentary along the way. It runs on the hour on weekends in June and September and daily in July and August. It covers the historic areas including Fort Saybrook Monument Park , Fenwick the former home of Katherine Hepburn, the railroad station, the commercial district and the marinas. History buffs will appreciate Fort Saybrook which dates back to the earliest colonial times in this country, having been established in the early 1600s. Sadly, the African Queen, made famous by Bogie and Kate, no longer does tours out of Old Saybrook but has been moved down to Florida. About a mile beyond the village you'll find the Saybrook Point Mini-Golf Course, the Fenwick Golf Club, the beaches, Lynde Point Lighthouse and the breakwater. Harvey 's Beach is the town operated beach and has public restrooms and shower, as well as an occasional concession stand. The beach is free to residents but charges non-residents an entrance fee. Returning back to Saybrook Point, grab a waterfront window seat at the Dock & Dine for fresh seafood, pastas and chicken dishes, or sit outside on the patio and choose from the full or Quick Bite menus. So enjoy, and we hope to see you there again soon.